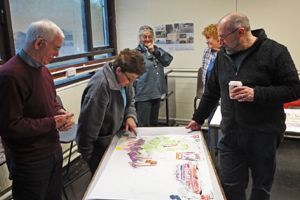 Iwan Bala talks with Fine Art students John Lloyd and Gay Wilkinson Lifelong Learning at Bangor University was pleased to introduce a renowned artist to its students recently. Iwan Bala joined the fine art programme on Friday 11th March for a comprehensive lecture of his work and later in the day led a workshop with fine art degree students developing themes identified in the lecture, particularly the idea of mapping in response to ideas of identity, place and culture. These have been Bala’s main themes and preoccupations in his work as an artist and writer. Bala, a former member of the Beca group, has actively engaged his audience with Welsh cultural and political issues by expanding his practice into writing, lecturing, activism and collaboration, and all the time underpinned by a drawing process that frees the imagination and explores images for the communication of ideas. Students were able to reinvent their own personal journeys and reflections on identity and history during the afternoon workshop when the new studios at Hiraethog were fully utilised. Bala was able to talk to everyone individually and was unrelentingly generous with comment and reflections on everyone’s practice. Lifelong Learning offers a wide variety of fine art courses across north Wales. The courses are taught by a team of practising artists of repute, if you want to ‘get somewhere’ with your art, or maybe you’re an artist in need of new ideas and creative input, contact Annie Davies on 01248 382475 or visit the website www.bangor.ac.uk/ll for further information about the courses.